Steven Soderbergh's four-time Oscar-winning crime drama joins the Criterion Collection this January. 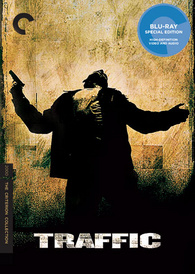 In an early announcement to retailers, Criterion has revealed 'Traffic' for a Blu-ray release on January 17. The movie has already been released on Blu-ray by Universal and is reviewed here. With an innovative, color-coded cinematic treatment distinguishing his interwoven stories, Steven Soderbergh embroils viewers in the lives of a newly appointed drug czar and his family, a West Coast kingpin’s wife, a key informant, and police officers on both sides of the U.S.-Mexico border. The Blu-ray will feature a restored digital transfer, supervised and approved by director Steven Soderbergh and supervising sound editor and rerecording mixer Larry Blake with 5.1 and 2.0 surround DTS-HD Master Audio soundtracks, and supplements will include: Three audio commentaries, featuring Soderbergh and writer Stephen Gaghan; producers Laura Bickford, Edward Zwick, and Marshall Herskovitz and consultants Tim Golden and Craig Chretien; and composer Cliff Martinez; Twenty-five deleted scenes, with optional commentary by Soderbergh and Gaghan; Three sets of demonstrations: one on film processing and the look of the Mexico sequences; one on film editing, with commentary by editor Stephen Mirrione; and one on dialogue editing; Additional unused footage of various scenes, from multiple angles; Theatrical trailers and television spots; Gallery of trading cards depicting the U.S. Customs canine squad used to detect narcotics and illegal substances; and a booklet featuring an essay by film critic Manohla Dargis. You can find the latest specs for 'Traffic' linked from our Blu-ray Release Schedule, where it is indexed under January 17.